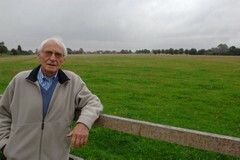 A Burton Mail article on 7th May 2009 reported that Frank Bather, an East Staffordshire Borough Councillor, is calling on people to join a 'pressure group' in a bid to persuade Burton College not to sell off its former playing fields in Rolleston. He is hoping that the land can be transformed into a community sports facility. Anyone wishing to join the pressure group can telephone Councillor Bather on 01283 812532. Burton College has been accused of ’playing games’ over its plans for an unused sports field. The former Forest of Needwood Secondary School, in Station Road, Rolleston, closed on March 31, 1985, despite a long and arduous battle to save it. Staffordshire County Council handed over the premises and grounds to the college free of charge to use as its Rolleston Campus. When the campus was subsequently shut, the ’brownfield’ — previously developed — part of the site was sold off to a developer for a major housing estate, reportedly earning the college a windfall of up to £5 million. However, the former college sports field at the rear of the housing estate remains unused, and community leaders want the site to be retained as a sports facility for villagers. It seemed their aspirations had been dealt a blow when the minutes of the January meeting of the college accommodation committee — a copy of which has been seen by The Mail — spoke of the ’college’s wish to obtain planning permission for housing development on its land at Rolleston’. The Mail asked the college to elaborate further on the minutes and reveal its formal intentions for what remains a publicly owned asset. However, bosses have now backtracked on the content of the published minutes and instead issued a vague statement about its plans. A spokesman said: "The college has no plans to obtain planning permission for its land, but would need to maximise the proceeds from its assets should it dispose of them." Calls have now been made for the college to be more open and transparent about its intentions. Rolleston resident Frank Bather, who represents Stretton on East Staffordshire Borough Council and who is a member of the area’s sports council, said: "The college has been playing games. We are in serious need of sports facilities and this is a gem of a site, right in the centre of the community. We want more clarity and openness from the college, and I think it is being very selfish about this. They have gained so many advantages from this particular site and there is a great deal of support for more sports facilities. College bosses have said in the past that opening the land up for sport would result in ’serious legal complications’. The need for extra sporting facilities was highlighted last year when Stretton Eagles Football Club and Rolleston Cricket Club applied for permission to create new pitches on land in Dovecliff Road. However, the scheme was rejected after planners said that accepting the proposals could create a dangerous precedent as the site — including an associated housing development — was outside the village development boundary. Another article in the same paper talks about how vast swathes of countryside around Burton could be bulldozed to make way for housing. East Staffordshire Borough Council’s Housing Strategy — a ’five-year plan’ outlining the authority’s housing needs — lists more than 100 predominantly greenfield sites across the borough which could be allocated for new homes, including the sports field and Craythorne Golf Club. A final list is set to be approved by the full council in the summer. If you wish to make comments on the Draft Strategic Housing Land Availability Assessment document please do so by using the comments sheet on the East Staffordshire Borough Council Planning Policy webpage or write to Philip Somerfield, ESBC Planning Policy Manager, e-mail: philip.somerfield@eaststaffsbc.gov.uk. All comments should be submitted by Friday 17th April.